Our trained operatives can clean drains from four inch diameter all the way up to large culvert pipes. We operate contracts for local authorities, private industry and a number of management companies and hotels. We have a comprehensive fleet of high pressure water jetting units from Van Pacs to Vactor Units. Blocked drains are the bane of homeowners everywhere. There are various things which can cause clogged drains. Some of the most common reasons for blocked drains are hair, food particles and grease. All these things can be easily prevented from causing havoc to your drains. However, not all people do what is needed to make sure that their drain is in top shape. Preventing blocked drains need not be very difficult. Prevention is better than cure and it will cause you less headaches and money. Blockages are caused by things which should not go down the drain in the first place. Sometimes, blockages can also be caused by corrosion or tree roots entering your drain pipes. What are the things you can do? Regularly pour hot water down the plug holes. This will help prevent debris or nay type of build up from forming in your drainage system. Refrain from flushing disposable items down the drain. This includes nappies, tampons and tissues. Throw them in the trash bin instead. Regularly check outside drains to make sure that leaves and other debris from the garden are not blocking them. For some people flushing down fat or oil down the sink is just something which they cannot avoid. If this also rings true to you, you should at least pour hot water down the sink with plenty of detergent. This will avoid encrusted fat from forming on the sink and causing potential blockages. Drain cleaning should not be attempted without proper training and the right tools. Most plumbing and pipes in the house can be easily damaged. A scratch can easily lead to permanent damage which will cost you more money in the end. Drain cleaning services use a variety of tools to address clogging, clearing water pipes and restoring proper water flow. Hiring professionals early will help ensure that drain cleaning, as well as plumbing services are done correctly and efficiently. 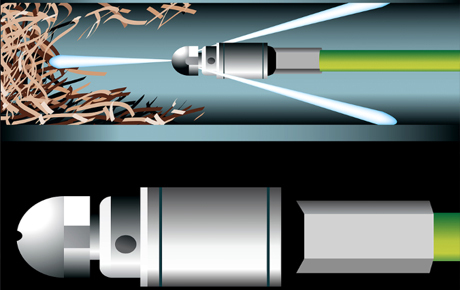 Using powerful high-pressure nozzles, we have the ability to blast through sludge, soap or grease-clogged lines, scrubbing them clean. We can even get those difficult bends, traps and frozen drains open quickly and easily.